A few months ago, a light was fixed in our church steeple is responsible for shining light through our rose window at night. Some night you should take a walk through town and stop across the street from the church and take a look up...way up. It's beautiful sight that wouldn't have been possible without the determination of four teenagers. 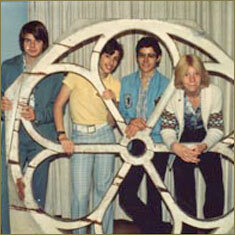 Sometime in the late 1970s, Lorin Kramer took his younger brother, David, into the steepleto show him the bell. 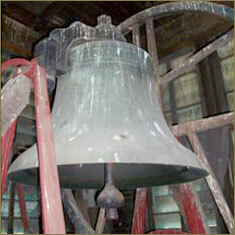 (Yes, we have a bell in our steeple!) On the way to the bell loft, theypassed a bunch of debris on the ringing loft. They went outside and saw the boarded up space in the front of the church and realized that there used to be a window in the front of the church. The boys took the pieces to the stage and found that everything fit together. Amazingly, all the pieces were there! At that time, the senior high Sunday school class met near the stage in the Fellowship Hall and was led by the youth pastor, Gary Robbins. The Sunday after the discovery Robert Brooks, David Kramer, Lorin Kramer, and William Nielsen were in attendance. The teenagers wanted to try to restore the window. Gary Robbins got approval from the Administrative Council to start restoration. After getting advice about appropriate materials and construction methods, Lorin bought plywood backing, screws and the suggested glue for the project. Bar clamps were borrowed, and the work was done in the Fellowship Hall for about a year. The assembled frame was taken to Ray Vass who tightened the exterior joints by routing new pieces of wood. The four kids did everything else on the frame including painting it. Lorin visited Gertrude Danser to look at her late husband's photos of the church. She was able to find a couple of photos that showed the rose window in place, but there weren't any color photographs of the window. The rose window may have been destroyed by a hurricane at some point and just boarded up. The kids hit a roadblock when they needed stained glass to finish the window. They had no money! After receiving an estimate from Princeton Stained Glass, Bill Schanck, Sr. offered a part of Mrs. Dolan's memorial money for the purchase of glass. This is where the story starts to get a little crazy. The frame was strapped to the top of a canoe rack on the Kramer family station wagon and driven by Lorin to Princeton Stained Glass in Princeton. Take a moment to picture that drive! Unfortunately, the store was closed when Lorin arrived; but as luck would have it, Walt Rodefeld owned the shop above PSG and was willing to take it until the glass guy returned. 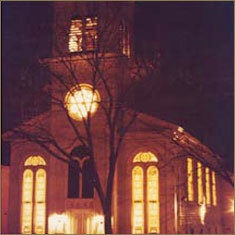 The glass was selected to match the glass in the side windows of the sanctuary. PSG cut the yellow petals and green leaves, and Lorin cut the red center. The frame was again transported on the station wagon with the glass pieces wrapped in cardboard. Once returned to the Fellowship Hall the pieces were fitted to the frame with glazing points and glazing compound. Now comes the tricky part - getting the window in the steeple. The four kids removed the wood stair treads from the back choir loft to the ringing loft and placed a ladder in their place. Somehow, the window was moved from the Fellowship Hall, through the sanctuary, onto the back choir loft, through the door, rigged with rope, and pulled into the ringing loft with a small block and tackle. Then they removed the boards that filled the opening for the rose window. Lorin described it saying, "Without falling to our bloody deaths through the opening, we inserted the rose window to its original location. With directions from the street, we shimmied the window to the correct height." William Nielsen borrowed his father's 40 foot aluminum extension ladder. According to Lorin, "It took all of us and some tense moments to put the ladder in place without killing ourselves or taking out the window. William was the only one crazy enough to go up the ladder and run a bead of sealant around the joint." 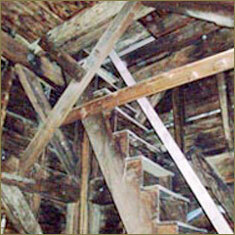 Finally, they removed the ladder to the ringing loft and replaced the stair treads in their original locations. There is a place on the door to the steeple that was purchased by Lorin for the rededication service of the window. The rededication service was lead by our bishop at the time, Bishop White.